BISS 03.02.17 : TIM & CHITTY / REBIRTH / SMOKED OUT SOUL / HUMIDORS & SOFA KINGS / WOOD BROTHERS / CONGRATS HUSHCONCERTS! Happy 20th anniversary to our long time friends at HushConcerts!! Many of us have been fans thru the years as Sunset Promotions evolved into Sunset SF, Silent Frisco and most recently into HUSH. We've been with them thru multiple years of North Beach Jazz Fest, SF Funk Fest, Sea of Dreams NYE, Ghost Ship Halloween, & Icebreakers Ball.... We've seen Rebirth at Mojito and Rebirth at Mezzanine. And who here didn't eat bacon at sunrise with Silent Frisco headphones on while playing kickball on the lawn? To celebrate this monumental milestone, they are throwing a party this Friday night at Bimbo's with Rebirth Brass Band plus Jazz Mafia and DJ Harry Duncan! Hopefully you already got your tickets because the show is SOLD OUT! However, there are still tickets available to see Rebirth on Saturday night at Starline Social Club! "They say that 'it takes a village to raise a family' and this statement has never been more metaphorically applied to a business than to our little unlikely 20-year boutique production company. We are so incredibly proud of the family we have raised but even more so of the support we have received from the village known as the Bay Area music community. We started this whole thing on Mardi Gras Day 1997 and 20 years later are still throwing down with New Orleans funk. Along the way we have had almost all of our business and music dreams come true. All of that is attributable to YOUR SUPPORT. Thank you!" You might wanna head over early and check out the Crafty Fox next door to Brick since they were just voted as best beer bar in California by craftbeer.com. 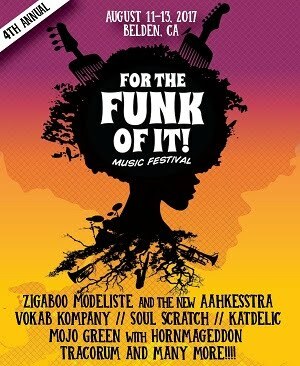 Before I get to my picks of the week, I want to let everyone know that early bird ticket sales have been extended to March 5th for my favorite little Nor Cal festival, For The Funk Of It! And for the lucky BISS Lister who spreads the word the most by sharing the event and letting people know about the early bird tickets, you could win a pair of tickets to the festival!